~Leave pecans out if there are allergy concerns. 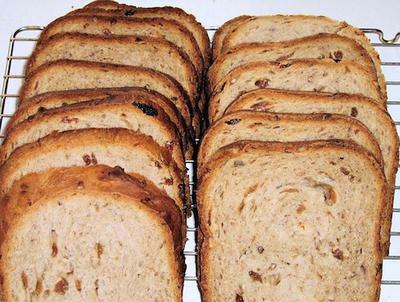 Put all the ingredients except the pecans and raisins into a bread machine pan. Lock in the pan, close the lid and set the machine to the sweet cycle. When the add ingredients signals add in the pecans and raisins.